We took a trip to Ansel Adam's Shangri-La and found not a soul, but the whispering wind and the silence of the wildflowers. We camped on meadow not used, wildflowers not seen, ancient lodge pole fallen but not heard, saw cliffs not scaled, and streams not forded far from the beaten track. The wonderful eternal silence of the mountains enveloped us. This rarely visited paradise was ours alone to behold, and in peak season to boot. 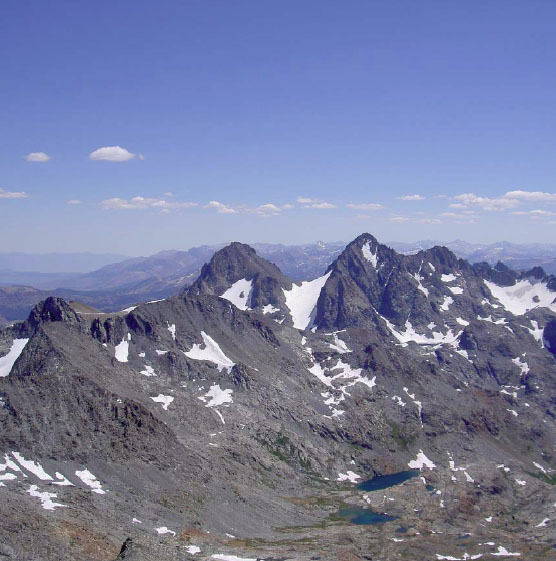 At our Agnew Meadow Trailhead, we climbed over Glacier Pass on the north shoulder of Banner Peak, descended to Twin Island Lakes basin and climbed peaks from there. 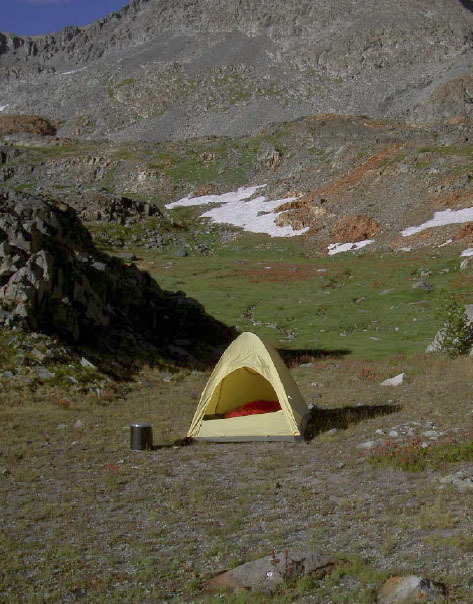 Day 3: Campsite at 10,100 feet to Rodgers 12,978 ft: 6 miles RT and 2880 ft.
Day 5: Campsite to Trailhead: 11.25 miles gain 1200 feet, lose 2700 feet. Day 1: We packed for a fast and light trip with our lightweight tent, enough food for 4 days, and no ice axe/crampons. We had great weather, and warm sunny days. We started at Agnew Meadows, chose the Pacific Crest Trail (higher and more direct) over the river trail (up and down but more scenic). We reached Thousand Island Lake in 4 hours, and then went over Glacier Pass. 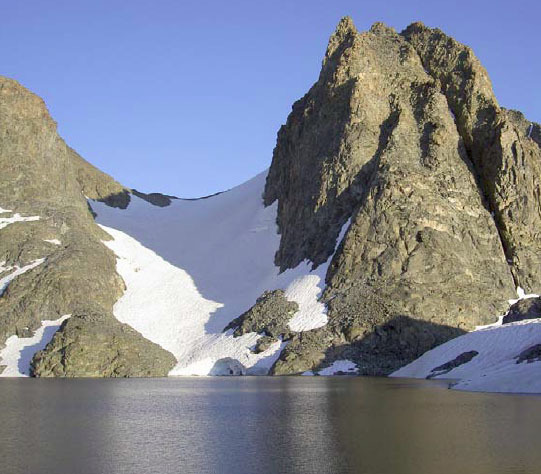 This pass, north of Banner Peak, is 11,100 feet high and is reached by going to the end of Thousand Island Lake. Incredible streams abound in this area, and one is featured in one of Ansel Adam's photographs. 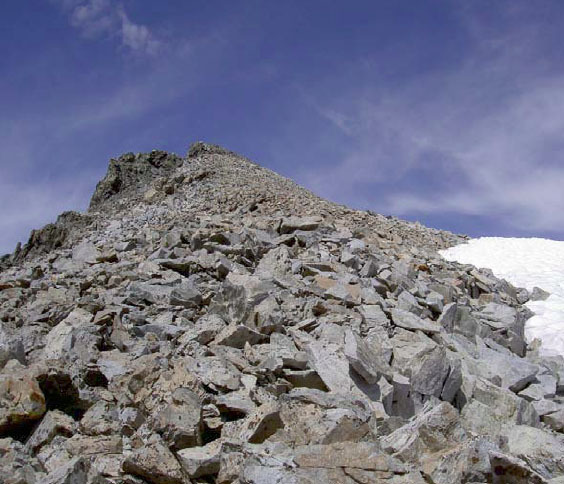 Reaching the Pass is an easy climb on granite slabs and steps, navigation aim for the gap to the north of Banner Peak. Once at the Pass, you'll climb over boulders, and boulder-hop down to the shores of Lake Catherine. This alpine lake is on the west side of Ritter and Banner, has well protected, flat campsites (Not immediately evident) on the NW side of the lake on some rock benches. We found enough spots for 6 tents, although we were the only ones there on this Labor Day weekend. We had the entire vista to ourselves and we enjoyed the shifting colors on the backs of Ritter & Banner. Snow banks abounded around us but we were on dry soil. Day 2: At sunrise, we headed up the drainage to the north of our camp to climb Davis. This is CL2 climbing all the way, climbing a small snowfield, and has a few ups and downs. Mt Davis, like it's brethren Ritter and Banner, is part of an ancient volcanic caldera. Davis, Banner, Ritter, and the Minarents form the Eastern boundary of the caldera. But, instead of finding igneous rock, you find metamorphosized igneous rock with a high iron content. This is true as well of Rodgers, with iron content so high that it will actually deflect a compass quite well. The Ritter range, composed of highly resistant metamorphic rock, deflected the ancient San Joaquin River southward until it could find a path west through the less resistant granite. This resistant rock however is jointed, and the Pleistocene glacial cirques carved the magnificent spires of the Minarets. Green Peak is the southernmost member of this group, Mt. Lyell the most northern member, although it is in the boundary between metamorphic and granitic rocks. After climbing Davis, we headed down to our campsite, broke camp, and descended the 1300 feet into the valley of the Twin Island Lakes. There is no trail, we stayed to the north of the stream that drains Lake Catherine and went down our own second class route. Route finding was straighforward, there were no ducks and we relied on map and compass. Once down, we headed north along the drainage to an un-named lake at 10,080 feet, on the west side of the valley and below a high waterfall. We could not find a single spot around this lake that had ever been used as a campsite. And all of the likely sites were carpeted with wildflowers a mix of 4 different colors of Indian Paintbrush (Lemmons, and 3 hybrid varieties), meadow flowers, Explorer gentian, as far as the eye could see. The poor, rocky soil around the lake was an incredible carpet of wildflowers. It took us about 1/2 hour to scout a site that would do minimal damage to the ecosystem, and we finally found one about 100 yards east of the lake, on higher ground near a small stream. There we made our happy camp, minimized flower squashing, and settled in for the night. This is at an elevation of 10,080 feet. Day 3: It dawned cold and dark, we were in the valley bottom at 10,100 feet and cool air pooled around us. Our goal for the day was Rodgers Peak 2880 feet and up-canyon for us. We followed the stream closest to the canyon wall, and were soon below a bench-wall, about 300 feet high, the center of which was cut by a bench-stream. 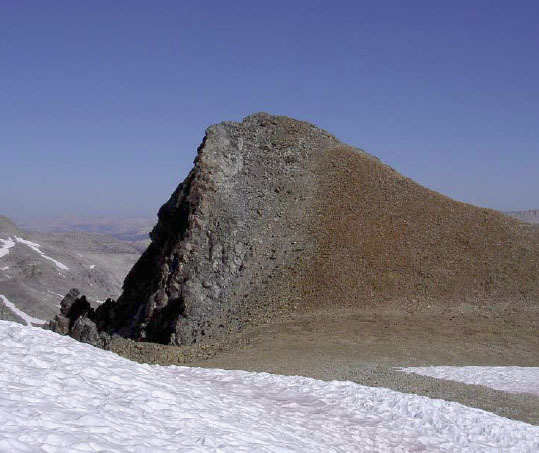 A CL2 scree slope was north of the stream, and CL3 south of the stream. We elected to take the low CL3 route south of the stream. Gaining the top of the bench, we were confronted with a snow slope. Because the snow was quite hard and icy, we decided to traverse the slope at the narrowest point, which then put us on a ledge just above a small lake which fed the bench-stream. This ledge was easily followed, had one 3rd CL section about 100 feet long, but otherwise uneventful. Proceeding up on the south side of Rodgers, a ledge can be found (obvious and in sight) that will take you up a low CL3 route to the CL2 part of the summit ridge. Once at the summit, we were rewarded with an incredible view of Yosemite's back side, Lyell and MaClure, Ritter and Banner. We took the same route back down to the bench-wall above the valley, and took an easy CL2 scree slope down on the east face of the bench-wall north of the exit stream. We were back in camp by 4PM. Day 4: Our next day was a climb of Electra. The slope south of our camp is composed of some great granite boulders and benches, mostly CL2 with easy route finding. Alternately, you can follow the creek down to Twin Island Lakes but we elected for some fun. We went south to the southernmost of the two Twin Island Lakes, and climbed a CL1 scree slope to a small ridge, dotted with Whitebark pines. On the way up, we eliminated some weeds (alien thistle, from Europe), and were rewarded with the best and thickest patches of Explorer Gentian that I've ever seen. From the top of the ridge, Electra was a hike across CL1 terrain, to possibly CL2 near the summit. These peaks aren't visited that often. After a siesta, we hiked back and were in camp by 4PM. Day 5: We went out the next day, did a bit of easy route finding to get back to Lake Catherine. Basically, you follow the defects in the rock and stay in between the Lake Catherine exit stream and the peaks on the left of the route. We followed our unmarked route back to Lake Catherine, down Granite pass to Thousand Island Lake, and were back at the TH at Agnew Meadows by 5PM. All in all, a great trip but if you go, please be very careful with the wildflowers and try to find a spot where they won't be trampled.